TapJets Inc. is now accepting BitCoin crypto currency as a form of payment for private jet charter flights. TapJets clients can now book a private jet in less than 30 seconds and pay using Bitcoins in their digital wallet. TapJets is the first private jet company to offer instant booking of private jets and the first such company in the World to accept #BTC payments at the time of booking. 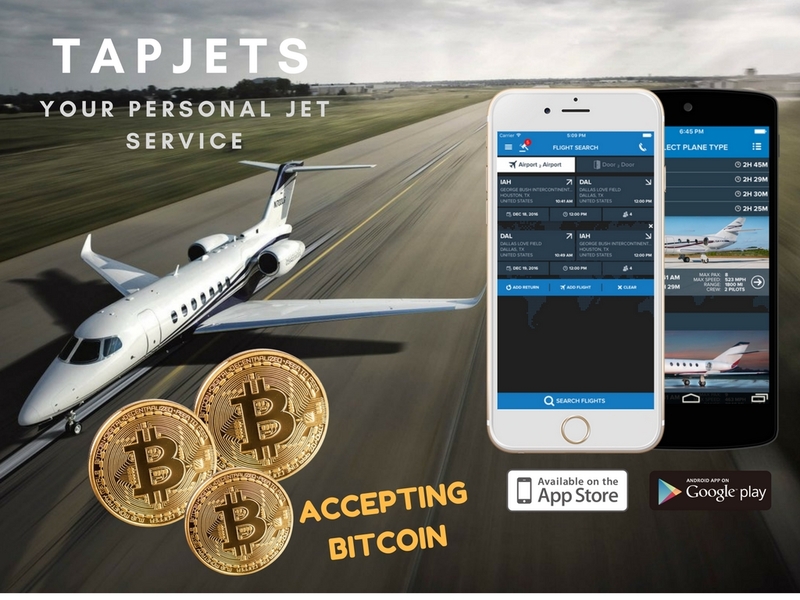 "Private jet travel has provided many folks with a discrete mode of transportation and accepting BitCoin makes such travel even more private," said Eugene Kesselman, Chief Executive Officer at TapJets Inc.
BitCoin payment option is now available on http://www.tapjets.com and iPhone App. TapJets Inc. was founded with the purpose of revolutionizing the private aviation industry with a "Hail-A-Jet"-styled smartphone booking system and simplified competitive pricing. TapJets travelers reserve private jets via the mobile app without membership fees, long-term commitments, or paying add-on fees like aircraft repositioning. TapJets services are available by downloading mobile application from Google Play or Apple App Store, or by visiting their web site at www.tapjets.com. With over 1700 hundred jets available at your fingertips, TapJets Inc is the largest consumer platform offering direct and instant booking in the United States. Also since 2016, TapJets FlightAuctions allows travelers to name their price on the flights that are commonly flown empty to their next destination.